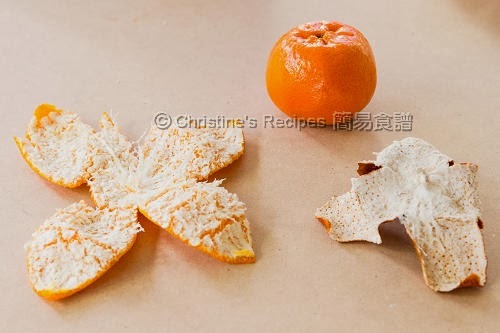 Dried mandarin peel / dried tangerine peel (陳皮 in Chinese, literally means old mandarin peel) has been widely used in Chinese cooking for hundred of years. We like to add a little piece of it into our soups, congee and even in desserts. It’s very versatile that can be used in many savoury or sweet dishes. Its subtle fragrance will enhance the flavour and take the dish up a notch. My mum used to make her own dried mandarin peel. Most of the Chinese people from Hong Kong find that the fragrance of Xinhui mandarin (新會柑), from the province of Xin Hui, China, is the best and benefits our health, thus it’s commonly used as Chinese herbals. The flesh of Xinhui mandarin is too sour to eat, yet people still are willing to get heaps when it’s in season at a quite expensive price, just for the skin. There’s no way to get any Xinhui mandarins here in Australia. 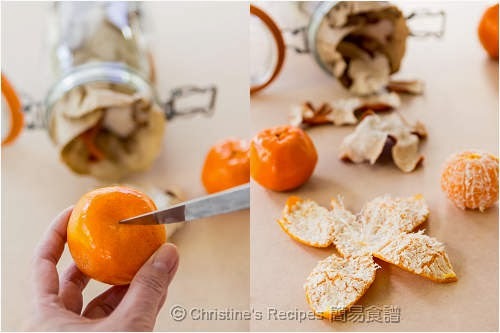 I tried to make my own dried mandarin peels with different kinds of mandarin from local produce, and found the aroma of each is quite different. Up to now, I’m quite pleased with the Imperial mandarin that is most similar to the fragrance of Xinhui mandarin. Best still, the flesh of Imperial mandarin is very sweet. Nothing would be wasted then. Clean mandarin thoroughly and pat dry. Use a knife to run around from top almost to the bottom and then peel open. Place the peels under the direct sun for about 3 days or more, until dried thoroughly, and become shatteringly crisp. Turn to another side once in a while during the sun-drying process. If you’re living in an area without much direct sun, you can place the peels in a low oven to dehydrate them. Store them in an air-tight jar or container. Place in a cool place. After one or two years, the peel will turn dark. You can use it to make any dish you like. The longer the mandarin peel is kept, the more fragrant it will develop. The flesh of Imperial mandarin is very sweet, not like the Xinhui (新會柑) that are too sour. You might test try with any kinds of mandarin that comes in handy from your local produce in order to find your own favourite. When it comes in using any citrus peels, try to go for organic as you don’t like the pesticide or fungicide residues. Or you can wash them thoroughly in warm water with a bit of detergent, or soak in salted water for a while. That said brushing a bit of baking soda on the skin before cleansing will work. The white inner skin tastes slightly bitter. I often scrape off the white layer after soaking it to be softened, then cook it with other ingredients. Sundried 陳皮! Why didn't I think of preserving some? Thank you for sharing, Christine. Thank you for sharing this with us Christine. Excellent idea. Usually I put fresh mandarine peel, right after eating one, on top of a radiator. Living in a cold area where mandarines are consumed during winter time this is a good thing to do. The fragrance always brightens the air. Usually the peels are dried after 2 days. Now I have to keep in mind to use them for cooking instead of tossing them away. Yeah, the mandarin peels are too precious to toss them away. I put the peeled rinks into my rice storage bin and it works fabulously. The rice dries it out and there is no trouble. I even throw in the whole mandarin. Trust me....it works!!!!! Very new idea to me. Great sharing ! Yum - now what recipe do you have for using up the flesh of this 1kg of mandarins? Well, eat them on their own, or juice them or make salad with them. These are good ways to consume the mandarin flesh very quickly. Looking forward for some recipes with dried mandarin peels. 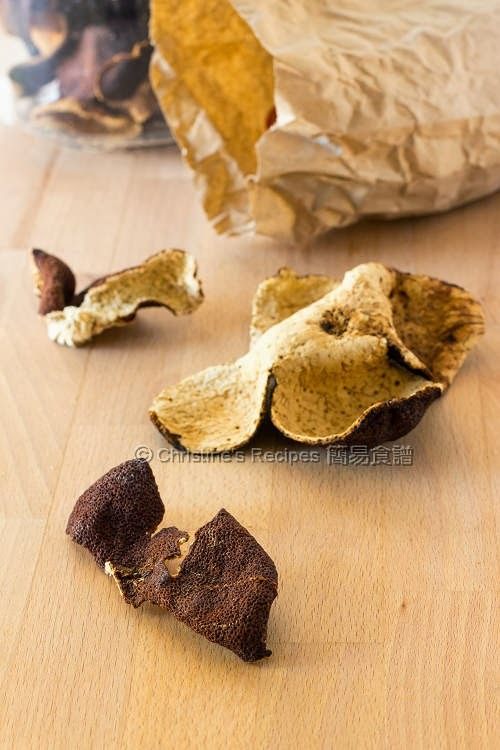 I've already got some dishes posted on this blog using dried mandarin peel. You might like to use the search box on top to find some you like. Will post some more when I make any new dishes with dried mandarin peels for sure. Even we are so close to the mainland, it may be tricky to get genuine XinHui tangerine peels nowadays... as it is said that the supply is getting less and less. Made a small amount of dried peels from some XinHui green mandarins last year, I should have bought more! This is fantastic! I'm always wary of DIY Chinese recipes because my mom and extended family have so much tradition to build off of--that is, I was wary until I started using recipes from your site. I would be really keen to see how these turn out, maybe candied (?) the way that we used to buy them for snacks when I was younger. Thank you, Christine! My father's been doing this for years with oranges and mandarins. I remember as a kid, he had the peels laying around the kitchen until they dried and then he'd stick them in a jar and use them in the coming months for his Chinese cooking. I picked up the habit, although I use it with hat water, to make teas. My Chinese cooking hasn't yet advanced to the point where I need to be doing that kind of prep for my dishes. 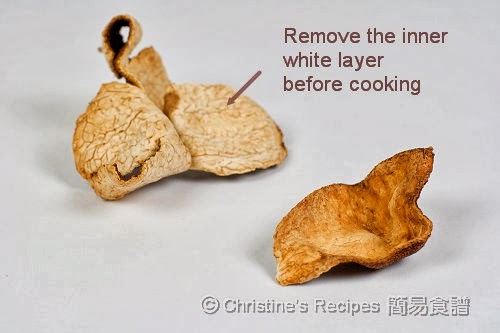 Christine, I saw your comment about having some dried mandarin peel recipes on the site, so I'll check that out. Fun photos here too, thanks.